Kamen no Ninja: Akakage (仮面の忍者 赤影, Kamen no Ninja: Akakage? lit. 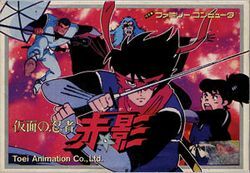 Akakage, The Masked Ninja) is an action game developed by Shouei and published by Toei Animation for the Famicom in 1988. The video game is based upon the 1987 anime series, which itself is based upon the 1967 live action television series. The story of this series revolves around the Red Shadow, a ninja who wears a red-and-black costume and a stylized red mask. His adventures take place in Feudal Japan, and he and his ninja sidekicks Aokage (青影, Aokage? a little boy) and Shirokage (白影, Shirokage? an old man) fight evil warlords, wizards and Kaiju using modern high-tech gadgetry (a blatant oddity in a period setting). The game itself is well animated, but otherwise not very noteworthy. It was only released in Japan, and as not been translated into any other language, although knowledge of Japanese is not necessarily required to play the game. This page was last edited on 14 January 2013, at 04:01.